This year TENT opens the cultural season with a long-weekend programme of festivities, starting Thursday 27 September with the opening of Only Weeds Emerge, a solo exhibition by Rotterdam-based Australian artist Pilar Mata Dupont. 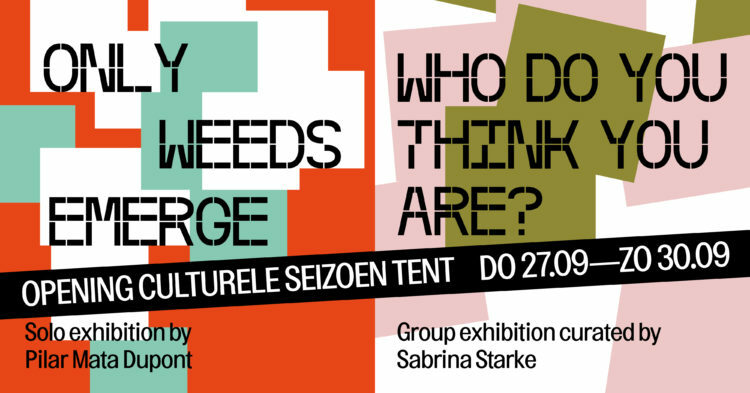 Friday 28 September, TENT presents two exclusives: the opening of the exhibition Who do you think you are? curated by Rotterdam singer-songwriter Sabrina Starke, and the very first showcase of her brand new album, Underneath the Surface, at the Arminius. Sunday 30 September, the last day of the Opening of the Cultural Season, Sabrina Starke and the HipHopHuis present Beats, Battles & Biographies, an exchange between people, cultures, and continents, all packed into a dance battle at TENT. The Cultural Season Opening at TENT is made possible by: Arminius, the Mondriaan Fund, CBK Rotterdam, Rotterdam Festivals, The Art of Impact and the VSB Fund.